As I begin this post, the house is still and silent. It’s 5:40, dusk has turned to darkness outside, and everyone’s been napping for nearly two hours. Part of me is inclined to wake them, because an extra long nap might make it harder to fall asleep later, but we’re all in such a relaxed vacation mode, I highly doubt anyone will have trouble. I love this quiet. 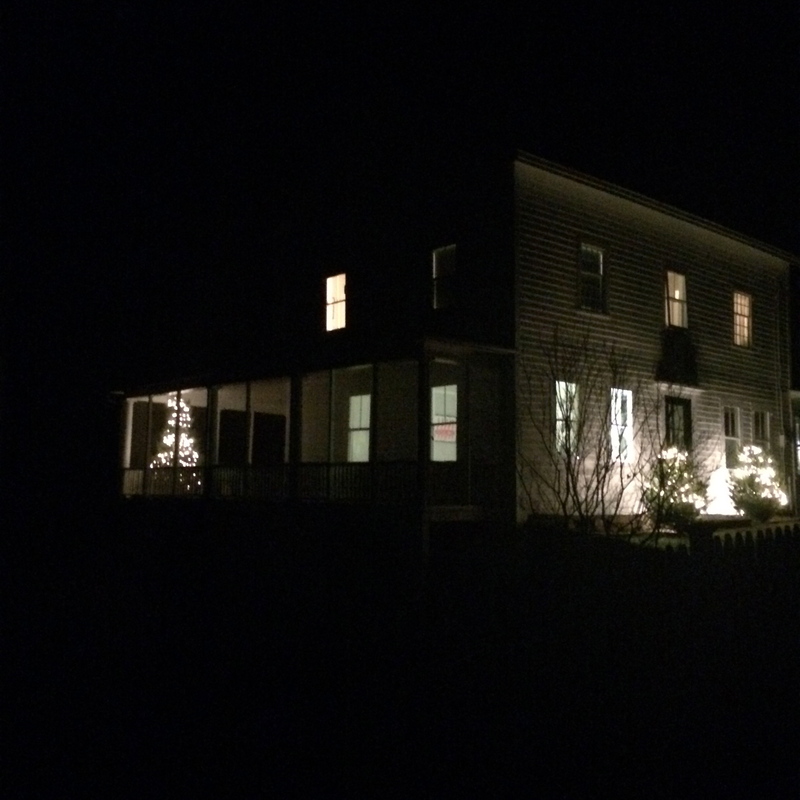 Through the dining room window, the two boxwoods framing our front door glisten with white lights, while, around the corner, stands our Christmas tree on the porch, brilliantly lit from hundreds of bulbs, providing a beacon into the dark living room. 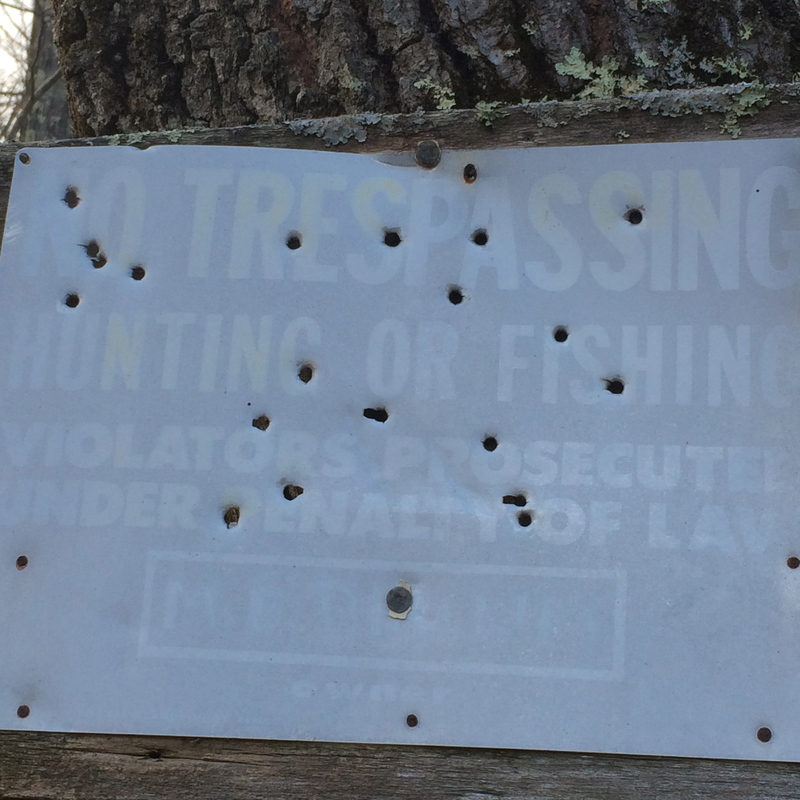 A “No Trespassing, hunting or fishing” sign littered with bullet holes. The irony. 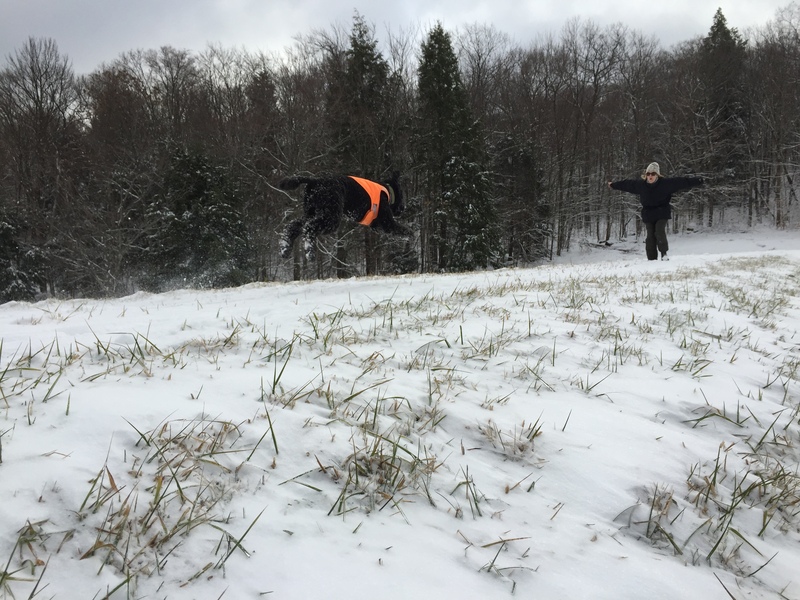 Earlier today, we took an extra-long hike to ring in the New Year, and to celebrate the end of hunting season. We kind of know that hunting starts sometime in October; after that, our grasp of the law gets even murkier. Crossbow hunting is allowed until the end of October, right? Slingshots and muskets through November…and rifles get the last hurrah until December hits…Or something like that. Jokes aside, we were indeed under the impression that all hunting ended right after Thanksgiving. That was until we saw two guys, decked out in camo and men-at-work orange strolling down our very own road two weeks ago with rifles slung over their shoulders. It was creepy. Despite the 31st deadline having passed, we all still wore orange on our hike. Bertrand wore his quilted reversible Uniqlo jacket, orange side out; Remy was Velcro-ed into her LL Bean dog vest (http://www.llbean.com), and me in my beloved Peak Performance orange parka. I’ve been jonesing for one of their parkas since I first spotted this Swedish brand at Whistler (http://www.peak-whistler.com/women-active-wear-jackets/), but, oof, they are pricey. 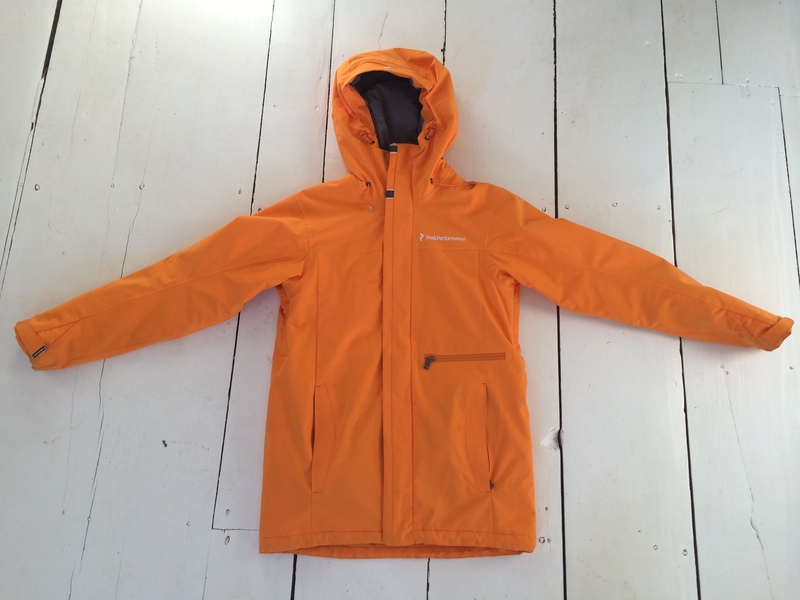 About a year ago, I spotted this tangerine baby on a sale rack outside a sporting goods shop in Switzerland and got it for about half price. I know what you’re thinking. But, it’s orange…tacky…‘To which, I happily reply, I know! 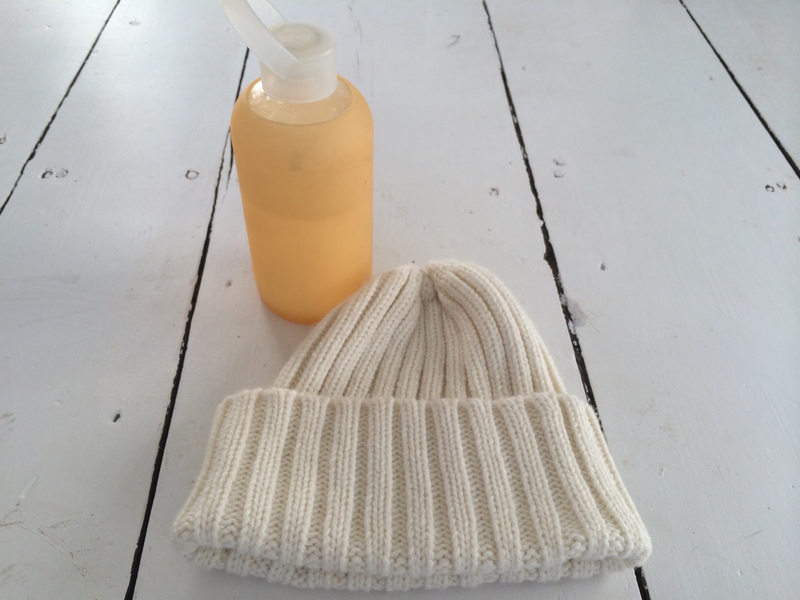 And it looks so chic with my white ski pants and ski helmut! And I never get lost on the liftlines! We hike every day when we’re up here, and the locations vary. Sometimes, we dip south into Connecticut to hike Bartholomew’s Cobble in Ashley Falls, Bear Mountain in Salisbury or Green Mountain Forest in Norfolk. Up here in the Berks, it’s either York Lake in Sandisfield, Ice Glen in Stockbridge or Cookson Forest in Southfield. And let us not forget the trusty Appalachian Trail, which winds its way through these parts, with a half a dozen or so connecting bases to keep things interesting and new. Have we ever made a night of it and slept in one of the App Trails many lean-tos? Hells, no! Why would we do that when a fully stocked kitchen and a screened in porch is ten minutes away? Above: Remy, mid-hike. 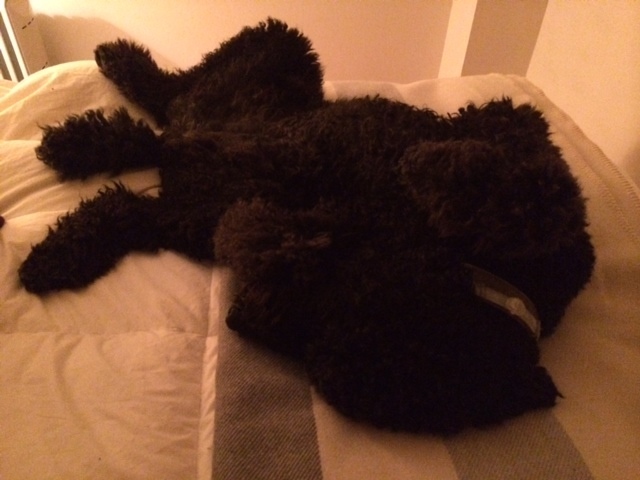 Below: Remy, post-hike. This afternoon, we spent three hours wandering through Cookson, and seemed to have the entire forest to ourselves, miles and miles of woods, crumbling stone walls and icy streams in which to wander, while Remy flew through it all like an expert skier zig-zagging down the glades. When I first learned how to ski moguls, an instructor told me to thank every mogul I stabbed my pole into because it was helping me turn. “Thank you!” (turn), “Thank you!” (turn), “Thank you!” (wipeout). As Remy slashes through the woods, leaping and dodging like a gazelle, we can practically hear her barking, “Thank you!” as she flashes past us. We bark a lot in these woods, too–sometimes, it’s to let hiding hunters know we’re approaching, or because we like to bark because we’re happy. So what if we have to share the woods with hunters in the Fall or deerflies in July? Well, yeah. So long as you remember to wear orange.